After an experimental phase, which decimated my nasturtiums much, here is another result - this time in the form of a potato salad. Fortunately, the stuff grows so quickly after. This is already a foretaste of the next series, in whicheverything will revolve around apples and potatoes. And do not fear the photo, if you throw everything into a bowl stir it, and run through the salad a few hours he can actually taste even better. Boil the potatoes, peel and let cool completely, otherwise they fall apart, then peel and cut into slices. Hard boil the eggs (10 minutes) frighten, and peel. Halve eggs and mash the yolks in a bowl with ingredients for the salad dressing. Halve the apples, core and cut into narrow columns. 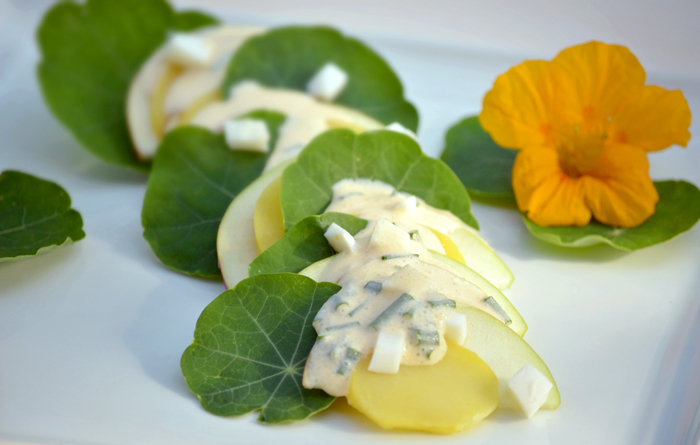 The columns alternately withthe potato slices and arrange on the nasturtium leaves the plates. The egg white incubes and put together with the sauce.